Every superhero needs a sidekick, and Matt Murdock is no different. Foggy may not have a black costume he jumps around in like Matt does, but that doesn't mean Foggy's wardrobe is boring or limited. The classic Foggy Nelson from the comics would wear some pretty crazy clothing, and the costume designers did a great job implementing that into this show. ​Foggy has his own style, his suits and printed shirts look great, and definitely are a different look from Matt's, but his ties are really what give Foggy his uniqueness. What brand is his watch? ​According to Daredevil's costume designer, "I didn’t want to buy him high-end clothes, so we looked around and found that Ted Baker, who’s actually another British clothier, did really fantastic suiting that worked really well for him." ​With that in mind, the details of his suits are pretty simple. Foggy sticks to solid colors mostly, and from what I remember they're usually just shades of gray, with a few suits having light checkered patterns. His suits are two piece, two button suits, just like Matt's suits. If you're interested in getting a suit that's as close to Foggy's as possible, then I'd suggest this Ted Baker checkered suit​. The gray with the light checkered pattern looks exactly like one of the suits Foggy wears on Daredevil. ​As expected with designer suits, Ted Baker suits are relatively expensive. If you already own a suit that looks similar to Foggy's, then you'll be able to save on the most expensive part of his wardrobe. ​If you don't own a suitable suit already, then I'd suggest a local department store, or even Ebay or Amazon if you already know your measurements. After looking around on Amazon, I found this two piece two button grey suit, and it even has a light checkered pattern like Foggy's. Daredevil's costume designer said, ​"I always wanted his shirts to be patterned..." which is mostly true throughout the season. When Foggy's not wearing a patterned dress shirt, it's usually an interesting color (not white). ​Unfortunately I haven't been able to find any information on exactly what brand Foggy's dress shirts are, but I think with something like a suit, you can still easily get the same look without finding exact matches. Fortunately, I was actually able to find some dress shirts that look exactly like those that Foggy would wear. ​They're these H2H patterned dress shirts, and they come in a ton of different patterned styles. I definitely think that going with a patterned dress shirt is something that will really bring the "Foggy style" out. ​Foggy's gold colored tie bar is actually something I didn't notice at first. Or rather, I should say I noticed it, but I didn't notice it had any significance at first. You might have already noticed, but there's the letter "F" on it. ​I'm assuming the F stands for Foggy, but the tie clip probably also has some sort of sentimental value (a gift from someone, perhaps?). ​Tie clips are pretty easy to come by, but if you want to cosplay as Foggy, I think an engraved clip is in order. Something like this customizable engraved tie clip would work great. Just make sure you specify that you want the "F" centered, and that the font size fills the space vertically. You'll also want to stick with a traditional font, like Times New Roman. ​Foggy's ties are a major part of his wardrobe, and really help set his style apart. The costume department loves Foggy's ties too - "He had a crawfish on one, grasshoppers on another. Every time we were shopping and found a tie that had some distinct little thing on it — a dog, a bull, a fork and spoon — we’d say, 'Oh, there’s another Foggy tie.'" So you can see that the biggest thing about his ties are their uniqueness and being slightly off the wall. Finding these cool ties seems like it'd be pretty fun to me, but if you're just looking for a few suggestions, I've found a few pretty cool looking ties. One of the closer matches to one of Foggy's actual ties is this Nautica Starlight red tie. It looks almost identical to the red tie Foggy is wearing in the screen cap up above. Another awesome, "Foggy-esque" tie I found is this dark blue tie with ice cream cones on it.​ It looks like a tie he'd wear, it's unique for sure. ​Compared to the rest of his clothing, Foggy's dress shoes seem like they're pretty normal. I haven't seen any crazy colors or designs on them, and they've all looked like basic dress shoes to me. 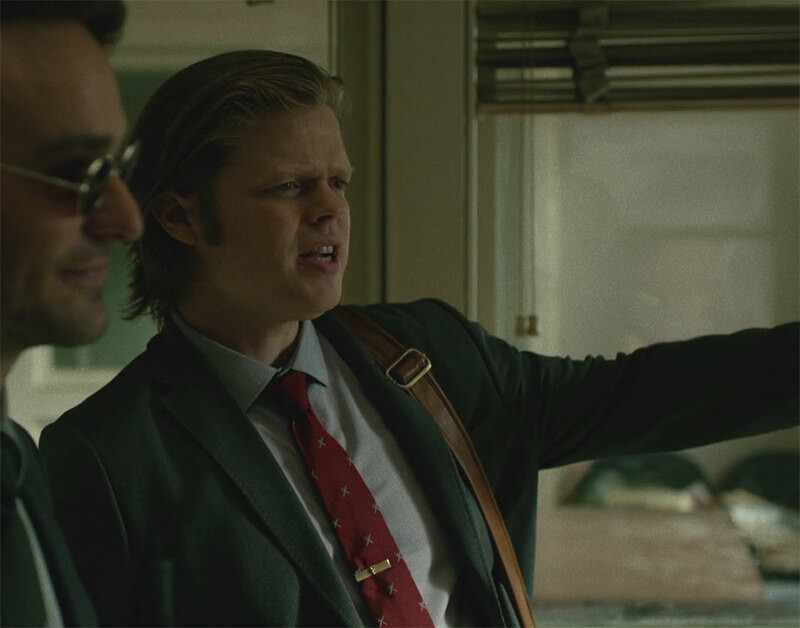 Unsurprisingly, there's not at much information out there about Foggy Nelson's clothing as there is about Matt's. But I did find ​a couple things that seemed accurate. The folks over at Skylight claim that Foggy wears these Madden Kazer dress shoes. I went through the episode (#5), and sure enough it looks like they're right. Another plus is that they're actually a decent price (about $50). Madden dress shoes are actually pretty good. They're comfortable, and they last me forever (although I don't wear dress shoes very often, so most dress shoes last me forever). ​For the price, Madden's can't be beat, and I doubt you'll find a dress shoe that's any cheaper that also looks as good. ​One of the only accessories Foggy wears is his gold colored analog watch. Other than being gold, the watch is actually pretty simple. The face isn't oversized like most men's watches are nowadays. It has a simple metal band, and just marks on the face to indicate time instead of numbers. Definitely not a modern looking watch. I'm not sure which model or even brand Foggy's watch is. I never did get a good enough screen cap to tell brand markings. But I spent a bit of time searching around and came across Nixon's line of watches. That watch is a bit on the expensive side though - especially if you're not going to wear it much outside of dressing like Foggy. If that's your case, then I'd go for pretty much any round, gold analog watch​ that you like, like this Timex one. Most of foggy’s tie bars are from Mens wearhouse starting in season two. Most of them are exact matches.